In the period 1992-1999 the RPV ultrasonic examinations at Kozloduy NPP are based on ASME Code and NRC RG 1.150 requirements. The recent examinations in 1999 have been challenged with temporary lack of the calibration block used for the dissimilar metal weld system calibration. The problem has been evaluated and the advanced technique of the ultrasonic system sensitivity adjustment based on the actual material noise level is selected. The sizing technique has been developed in order to provide results comparable to the ultrasonic results obtained by ASME Code application in 1995. The RPV ISI 1999 has been performed according to new developed approach and the results were compared with results of ISI 1995 and found not to have flaws growth. ISI 1999 sensitivity level has been verified upon arrival of the calibration block and found to be significantly above ASME requirements. Furthermore, the ultrasonic system is calibrated according to ASME standard procedure and examinations of the dissimilar metal welds are performed once again. All obtained results are compared and it is confirmed that advanced procedure gave the reliable results as well. In the period from 1992 to 2000 the VVER-440, Reactor Pressure Vessel (RPV) ultrasonic examinations at the Kozloduy NPP are based on the ASME Code Sec. XI and US NRC RG 1.150, requirements. The examinations have been performed using In-Service Inspection (ISI) Tool, which represent the latest application of most advanced robotic technology. The Ultrasonic Data Recording and Processing System (UDRPS II) is employed to record, enhance and analyze ultrasonic data. UDRPS II is fully integrated with ISI Tool to record all the examination data and assess indications.In addition, the most advanced techniques are applied for the characterization and planar/volumetric flaw sizing how is defined in the particular Procedure. 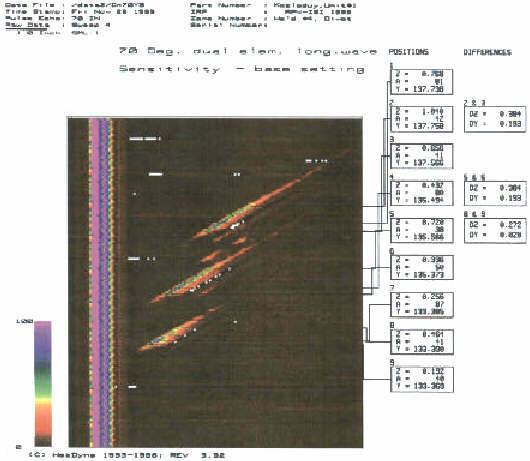 The recent examinations of Unit#1, RPV in 1999 have been challenged with temporary lack of the calibration block used for the dissimilar metal weld system calibration. The Inetec and Kozloduy NPP jointly investigated several possible solutions for the nozzles bore dissimilar weld examinations and below described approach are considered as technically the most acceptable solution. The system calibration has been based on the calibration data obtained in 1995 when previous inspection took the place. At that time calibration was performed with use of the calibration block and data were stored on an optical disks. These data were restored on the same ultrasonic system what includes; pulser setting (triggering voltage, number of pulses and cycles, pulse duration and damping), receiver setting (low and high pass filters, attenuation) and distance amplitude curve (DAC) correction. It means that for the particular ultrasonic system used for the examinations in 1995 and 1999 as well was crucial to provide the same essential parameters values as it was used in 1995. Further the same type/design of the transducers and cable lengths were applied. Only one essential parameter, not remaining the same in comparison to 1995 was system sensitivity level. The possibility to achieve lower sensitivity level in comparison with ISI 1995 i.e. in the link ultrasonic channel-cable-transducer was avoided by extending the use of the system capabilities. The attenuation of the receiver section for each transducer is adjusted so the average material noise is raised in the range of 10 to 20% full screen heights (FSH). Thus, conservative, high sensitivity level is provided while tolerably high noise level is defined to be acceptable. This approach i.e. the inspection sensitivity adjustment/calibration over analyzing the statistical results ("material noise") of, the scanned areas by means of the Histogram program in the data analysis software of the UDRPS II for each inspection channel has been qualified by WesDyne/Inetec through PDI program in 1997 held by EPRI, USA. manner as it has been performed in 1995. On that way correspondence and correlation of the results between two sequential examinations is provided. This means that each indication will be analyzed separately and in accordance with the same rules applied for a sizing in 1995. Figure 1 presents the same indication recorded while scanned with different attenuation settings i.e. different system sensitivity level. The measuring of the through wall size is performed for both scans in the same manner-by technique of 6 dB drop. Based on results obtained it may be concluded that there are no differences (DZ) in measuring through wall dimension regardless of the system sensitivity applied. Examinations of the dissimilar metal weldment joining the low-alloy vessel forging to the forged stainless steel transition spool piece were conducted from within the bores of all 12 nozzles. The scanning plan was devised so that the examination volume of all weldments was subject to four directional angle beam interrogations. This was accomplished with one axial and one circumferential scanning routine for each nozzle. In the axial scan sweeps (normal to the weld), 70° longitudinal ultrasound beams were directed towards and opposite to the vessel centerline. Also included in the axial scans were similarly directed 45° longitudinal search units. These units were used for interrogation of the deeper material volumes of the welds. A 0° transducer was used during performance of the axial scanning. For circumferential scanning (parallel to the weld), 70° longitudinal sound beams were directed in the clockwise and counter-clockwise directions. A 45° longitudinal, search units were similarly directed for the examination of the deeper metal volumes in the weld. In order to determine possible flaw growth for four calendar years of the RPV Unit #1 operation, a comparison of the ISI-1995 versus ISI-1999 results have been performed. The nozzle indications are confirmed to be within examination tolerances of the method and techniques applied. Due to applied higher sensitivity level, several more indications have been reported in comparison to examination performed in 1995. The comparison-example of the dissimilar metal weld ISI-1995 versus ISI-1999 results is presented in the Table 1. From the data obtained over the indication position, indication length and depth, through wall size DZ and D DZ between ISI-1999 and ISI 1995 it is concluded that there are no flaws growth and there are no new service induced flaws in the nozzle bore dissimilar metal welds. As it was stated before the same inspection parameters from ISI 1995, except attenuation i.e.sensitivity level, are used during the actual examinations in 1999. In order to achieve the higher sensitivity level in comparison with ISI 1995, for each transducer the average material noise is raised to the acceptable level of up to 20% of the FSH. Upon arrival of the calibration block (Figure 2) dissimilar metal welds examination sensitivity verification is performed by use of the same ultrasonic system and parameters used during the actual examinations in 1999. It means that each combination of: transducer - cable - ultrasonic instrument channel applied for the examinations has been verified for the sensitivity level on the calibration block. The particular calibration reflectors (side drilled holes) have been dynamically scanned and obtained data - signal amplitudes are compared with calibration block corrected distance amplitude curve (DAC). The signals amplitude of 100% DAC (80% FSH) presents the referent sensitivity level defined by the Procedure. The differences-example between obtained amplitudes and 100% DAC for particular calibration reflectors and transducers are presented in Table 2. The sign + in front of value in the column "Amplitude difference (dB)" means that amplitude of the particular referent reflector on calibration block needs to be attenuated by obtained number of dB in order to reach referent amplitude level of 100% DAC. Based on obtained results presented in Table 2 for the performed sensitivity verification it is concluded that examination sensitivity established in accordance with Approach explained in paragraph 2 exceeds the ASME Code Section V sensitivity requirements and the inspection Procedure as well. by obtained results through calibration block sensitivity verification. Based on above facts it is stated that a reliable ultrasonic examination of the dissimilar welds of RPV, Unit #1 has been performed regardless the system has not been calibrated on the calibration block. Beside the statement and conclusions made in the previous paragraph a standard ASME Code dissimilar weld examination is also performed. All indications detected in the dissimilar metal welds are evaluated in accordance with ASME Code Section XI, acceptance standards IWB-3514-1 and IWB-3514-2 and found to be acceptable. In order to determine possible flaw growth for four years of the RPV Unit #1 operation, a comparison of the ISI-1995 versus ISI-2000 results has been performed. All nozzle indications found during the ISI-1995 in the dissimilar metal welds are confirmed in ISI-2000. The comparison-example of the nozzle bore dissimilar metal welds ISI-1995 versus ISI-2000 results is presented in Table 3. The obtained results in ISI-2000 are found to be within examination tolerances of the ultrasonic method and techniques applied. Based on comparison of the ISI-1995 versus ISI-2000 results it is concluded that there are no flaw growths and there are no new service induced flaws in the nozzle bore dissimilar metal welds between two examinations. Also a comparison of the ISI-1999 versus ISI-2000 results has been made. It shows the difference in the number of detected indications. The ISI-1999 results revealed several indications found in addition to ISI-2000 and ISI-1995 as well. This is explained by the fact that ISI-1999 has been performed according to the "Approach" while ISI-2000 has been performed according to the standard ASME inspection Procedure. According to this Procedure above mentioned several indications are found to be below reporting threshold of 50% DAC. The Kozloduy NPP RPV, Unit #1 nozzle bore dissimilar welds have been examined in two inspection campaigns. All indications having measurable dimensions and interpreted as valid were assessed to the ASME Code, Section XI, and found to be within the allowable limits specified by IWB-3000, Paragraphs IWB-3514-1 and IWB-3514-2. Based on comparison of the ISI-1995 versus ISI-2000 results, obtained by use of the standard ASME procedure, it is concluded that there are no flaw growths and there are no new service induced flaws in the RPV, Unit #1 dissimilar metal welds between two examinations. The results of the ISI-2000 confirmed the conclusion stated in paragraphs 3&4 that a reliable ultrasonic examination in of the dissimilar welds of RPV, Unit #1 i.e. ISI 1999 has been performed regardless the system has not been calibrated on the calibration block.